She goes with “Plan B” and marries one of the rebound guys, Chris or Drew. She lives the rest of her life alone on Antigua with a bunch of cats, and if it’s anything like Madeira Island she won’t have any trouble finding some. Now, they say what doesn’t kill you makes you stronger, but obviously “they” have never been in love before, because having your heart broken often turns you into a blubbering, sloppy mess of a person. 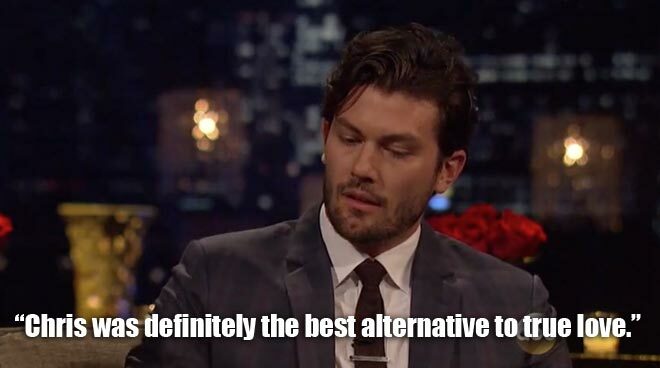 That is probably an accurate way to describe our Bachelorette Desiree after last week’s heart-ripping out ceremony, courtesy of Brooks. And while Des may have felt like she had just visited Mola Ram from The Temple of Doom, I hope she can put this experience into perspective and realize there are other roses in the garden. Was it something I said, or something I did? See Des, even THESE GUYS know how to find true love, and loving someone who doesn’t love you back means you’re doing it wrong. However, a broken heart does take time to mend, and unfortunately time is something that is not on Desiree’s side at the moment. I mean, she pretty much has to roll out of bed the next day and maybe give roses to a couple of guys she may or may not love, but who could very well propose to her the day after, and then quite possibly might have to live with that person for the rest of her life. See, there’s a silver lining to everything! She’s going to be the Crazy Cat Lady of Antigua, isn’t she? Just like the Men Tell All episode, we are treated to a live studio audience for The Final Rose finale. 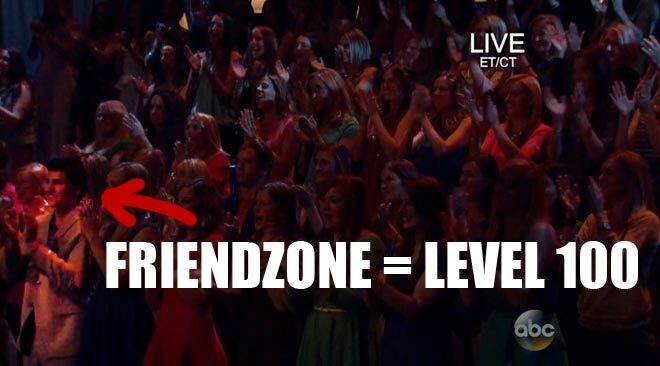 And surprise…it’s 99.999999% women, except for that poor, girlfriend-less guy in the front row. Don’t think I can’t see you down there, bro. I’ve read enough Where’s Waldo? books in my day to spot someone in a crowd. And, because The Bachelorette appeals to multiple generations, we have the token old people in the audience. Hmmmm. That old lady looks EXACTLY like the one from the Men Tell All episode, and that old guy was only there because the Dodgers had an away game or Duck Dynasty was a rerun. However, this didn’t start off as your usual joyous, happy finale. Everyone looked genuinely concerned and almost scared, like they were watching someone defuse a bomb in the middle of the stage and they weren’t sure if he should cut the red wire or the black one. Uh, this isn’t The Hurt Locker, ladies. This is a real-life story about kind-of, sort-of true love. Let’s see some smiles on those faces. But they can’t. 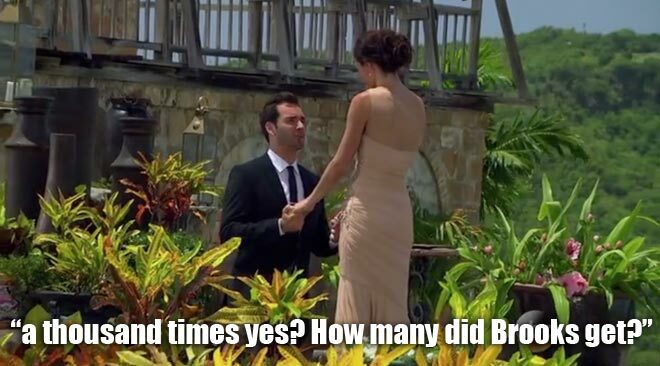 No, not until Brooks either returns to Antigua to sweep Des off her feet just before Drew or Chris are about to propose to her…in the rain, OR he somehow breaks into the studio and does it on live, national TV just as security is pulling him away because, MOVIES! Yes, just like Des and most of the Bachelors, the audience can’t see past the ending everyone wants to see: a fairy tale. Has anyone in the audience ever considered what they would do if this were real life, and Desiree was one of their besties? They would want to murder themselves. To make sense of her feelings, Desiree seeks the wise counsel of host Chris Harrison. However, she insists she’s “just fine” even though she starts crying when he asks how she’s doing. So basically you can’t ever start a conversation with Desiree if it involves general courtesies or small talk. OH YEAH, I HEAR WEDDING BELLS, PEOPLE! Des decides she “wants to continue on” like she’s suddenly doing one of those physical challenges on Survivor. Can she give Chris or Drew the life they deserve? Ok, you’re head over heels in love – we get it Desiree. Get a room. 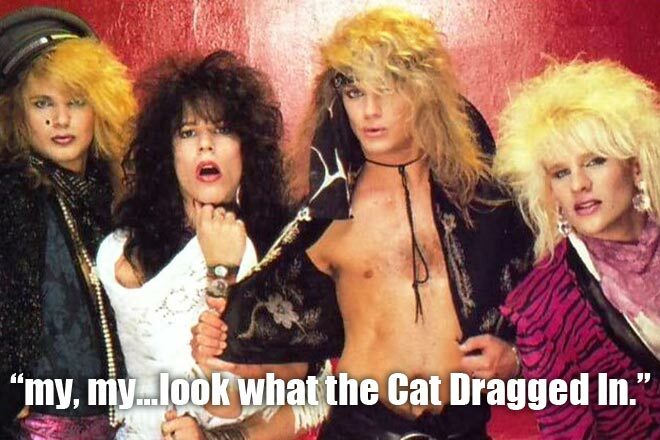 Oh, and hopefully Chris or Drew never see this. 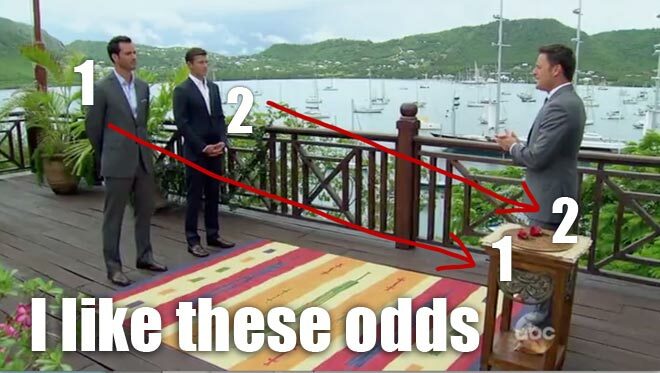 Chris Harrison meets Drew and Chris for the rose ceremony, who until this point are completely unaware that Brooks has left the show. Chris breaks the news to them in the best way possible. And then the camera pans to Chris and Drew, who’s horrified facial expressions suggest that they think Brooks is dead. Seriously Chris, your delivery was no better than Dr. Fishman on Arrested Development. Now, I wasn’t a math major and I don’t frequent the tables in Vegas, but I feel confident in saying that both Bachelors will each receive a rose. This begs the question: Why is there a rose ceremony? Well, judging by how many times Desiree told them to “just say NO if you don’t want the rose” I think we know why. She was trying to get rid of both of them without actually telling them to leave. It’s kind of like when your friend calls you when you clearly don’t want to talk, and you spend every five minutes telling them “Ok, well I better let you go now” to see if they’ll take the hint. Needless to say, both Drew and Chris accepted the roses, but not without appearing very uncomfortable about doing so. No one likes winning silver at the Olympics. Then it was huggy-time, and at first Drew looked mildly annoyed – but courteous – as Desiree fell into Chris’ soothing embrace. …but that quickly turned to a look of horror and seething hatred, like he was forced to watch a litter of young kittens being murdered. Des better be on the phone to witness protection. Even though Desiree clearly favored Chris at the rose ceremony and has been publicly mourning the departure of Brooks, Drew the Faithful Dog is still super in love with her. Des was trying to avoid another pre-date make-out session so she cleverly arrived on horseback. “There’s no way he’ll try to kiss me when I’m all the way up here,” thought Desiree. “Oh ok, we’re really doing this,” wondered Desiree, angrily. Drew proceeded to ask all the things a normal dog would right before they were about to be taken into the woods and shot, while still finding time to check the status of his nicely groomed hair. While Drew claims he has “no doubt or hesitation at all,” their conversation down to the picnic area was especially awkward, like we were watching two fifth graders hold hands for the first time. WHAT!? DESIREE IS BROOKS-ing DREW!!!! Oh man, he’s totally going to kill himself, isn’t he? Prepare for a big lawsuit, ABC. A shocked Drew could only thank her for being honest, and then like a dog who’s been given away by it’s owner, he awkwardly walks off and is forced to cry in a mini-van in front of a couple of locals. You probably deserved better, Drew, but you taught us all a valuable lesson: that it IS possible to love someone too much. 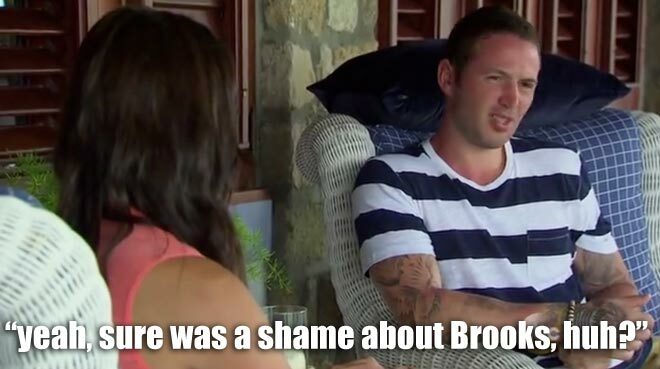 At first I was disappointed in Desiree for choosing to break up with Chris in a bikini top, but then I realized she was just using it as a distraction so Chris wouldn’t have to look into her sad, weeping eyes and know that she’d rather be hanging out with Brooks. But after a few smiles and laughs, it seemed like Desiree was coming around to the thought of being in love again, and then once they were on the boat together you knew there wasn’t going to be an awkward break-up. Well, and where would Chris go if she did decide to send him home? They’re like…on a boat. Can she really throw him a life jacket and tell him to swim to shore? Probably, but then again he IS really athletic. Chris’ gift to Desiree is a journal that includes all the poems he wrote to her. And so are we for not having to hear any more poems. Chris was less thankful for that comment, but he’s still excited to meet Desiree’s family. Desiree’s parents seemed very nice, but also were one of those couples that start to look alike as they get older. “Why? Because I’m the only Bachelor left on the show,” says Chris, in his head. Despite only knowing Chris for about an hour, he approves of Chris asking Desiree to marry him. Even her rough-looking and mostly douchey brother gives her the thumbs up, but not before he opens up some old wounds. After picking out a ring that he totally didn’t buy himself, Chris arrives to meet Desiree. What follows is the most awkward “getting on one knee” in the history of marriage proposals. I knew Chris was lying when he said how confident he was. Chris finally proposed, and Desiree answers with some cheesy line she copied from Pride and Prejudice. “Yes! A thousand times yes!” even though this is the first time she’s said it to Chris. It’s probably fine, though, considering that Chris already stole his fake “I need to tie my shoe” proposal from Jim on The Office. In fact, I think up to this point she’s actually told Brooks she loves him more than she’s told her future husband. I give this thing six months. Desiree comes out to chat with Chris Harrison and show off her new bling, which after some research I found out cost around $65,000 – or about 650 of the rings that Zak bought her. Instead of focusing on the “love” of her life, all anyone wants to know about is the person she really loved – Brooks. I swear at this point there were still several audience members who still thought he was going to come crashing through the doors and “rescue” her from her fiancé. And speaking of Brooks, he enters to a chorus of cheers from the crowd. He says how nervous he is to see her, and she thanks him for his honesty…and his going away. Brooks doesn’t know what happened with Desiree or that she’s engaged to Chris. When he finds out he’s not surprised at all. Drew comes out next and despite being the “sweetest person she’s ever known” kind of gets all up in Desiree’s grill about his unceremonious break-up. I’m just glad he finally realized that Chris’ 30-second hug at the rose ceremony meant WAY more than his 2-second hug. JUAN PABLO IS THE NEXT BACHELOR!!!!!! And seriously the crowd just erupts like they’re on an Oprah’s favorite things episode. YOU GET A JUAN PABLO! AND YOU GET A JUAN PABLO! EVERYONE’S GETTING A JUAN PABLOOOOOOOOO! Without the weekly breakdown this Bachelorette Season would have been a major fail. I’m going to miss these.